Other name: degree-two cone (implying: non-decomposed). Reduced equation: (with , cone of revolution if and only if a = b). 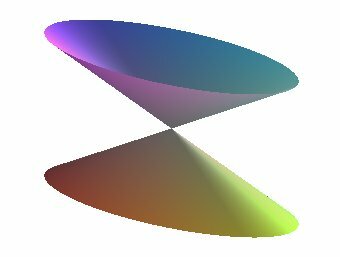 Half minor angle at the vertex: . Another reduced equation in the case where one of the 2 angles at the vertex is right: ; the other angle then is (cone of revolution for k = 2). Elliptic cone with its curvature lines, i.e. its straight lines and their orthogonal trajectories. 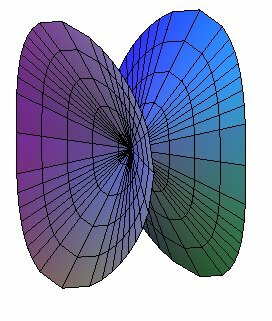 An elliptic cone is a cone a directrix of which is an ellipse; it is defined up to isometry by its two angles at the vertex. Characterization: cone of degree two not decomposed into two planes. See the level and slope lines of the cone here. See also focal circular cubic.